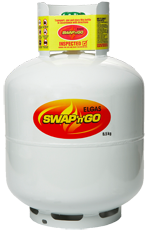 • You can swap any brand of 9kg BBQ cylinder at SWAP'n'GO. • Receive an inspected, tested and safely filled cylinder. • You never have to worry about checking test dates, SWAP'n'GO cylinders are always in date. Thank you for choosing SWAP'n'GO! *All gas bottles must meet certain safety standards. Please refer to the Bottle Checklist.